Well did you celebrate like Ian Duncan Smith on the announcement of the plans to introduce compulsory living wage or hold you head in your hands? I have put together a summary of the highlights of the budget below if you want to wade your way through the detail you can find the tax legislation and rates at www. gov.uk and a budget summary at Budget Summary. Personal Allowance – this is the amount you can earn before income tax is taken. Inheritance Tax – the inheritance tax threshold will increase to £1m when a property passed to spouse or civil partner. If a residence is passed on death to a direct descendant there is an additional nil-rate band, £100,000 in 2017-18, £125,000 in 2018-19 and £175,000 in 2020-21. It will then increase in line with the Consumer Prices Index from 2021-22 onward. The existing nil-rate band will remain at £325,000 from 2018-19 until the end of 2020-21. Currently 45% this is being reduced from 6th April 2016 to the recipient’s marginal rate of income tax. From 6th April 2016 the tax free income will increase from £4250 to £7500 also increases the level if an individual rents out rooms in a guest house, B&B or similar, providing it is their main residence. 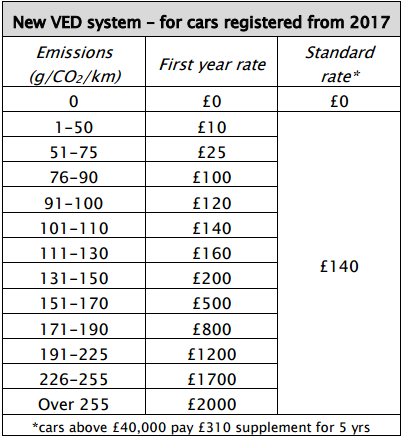 Vehicle Excise Duty – Car tax – this is one of the biggest U turns I have seen recently!! Dividend tax credit is to be replaced by a new £5000 tax free dividend allowance. Dividend rates will now go up from zero to 7.5% for basic income tax payers, 25% to 32.5% for higher rate taxpayers and from 30.56% to 38.1% for additional tax rate payers. University – from 2016-17 maintenance grants will be replaced by loans for students which will need to be paid back when they earn more than £21,000. Cars – Fuel duty has been frozen for another year, insurance premium tax is being increased from 6% to 9.5% but any new cars don’t need an MOT until they are 4 years old. Child Benefit- Tax credit and universal credit support will be limited to the first 2 children from April 2017 *multiple births like triplets are excluded from the limit. The budget covered a lot more topics than I have mentioned such as bank levy’s & the HMRC’s ability to take money out of your account if you owe them over £1000 and have aggregated across your accounts more than £5000. To see if you have won or lost this time around go to BBC Budget Calculator although if you draw income from your Ltd company via dividends this won’t be reflected in the calculation. Almost certainly if you do then you have lost out on this round. As a small business owner with 4 children I can honestly say that this is not a win win situation for my family. Equally as a small business owner I can relate to the issues faced with reducing costs and increasing income whether it be for a sole trader or the whole country. At Virtual Balance we work closely with our clients on this very issue and help them to make those tough decisions that are necessary to secure a brighter future. This entry was posted in Uncategorized on July 9, 2015 by virtualbalance.